Talmadge Neighborhood Watch prevents and reduces crime through community education, neighborhood volunteerism, and police & local government involvement. Block Captains and BlockWatches are active components of Neighborhood Watch creating awareness between neighbors and bringing us together! Our neighborhood watch is part of Talmadge’s commitment to a strong and safe community. Talmadge Neighborhood Watch works in connection with The Talmadge Patrol, both of which utilize social media tools Googlegroup, Nextdoor.com, and this website to keep the neighborhood informed and everyone active in Watch. In Talmadge, everyone is Neighborhood Watch! Talmadge Neighborhood Watch administers and utilizes a Block Captain Program to encourage neighbors living in proximity to watch out for the safety of each other. Block Captains keep neighbors informed on crime prevention and are a co-ordinated network across Talmadge. Connected, informed, and watchful blocks are safer blocks and make for a safer Talmadge. The Talmadge Neighborhood Watch program is coordinated by the Neighborhood Watch Chair, Mo McElroy who may be contacted at neighborhoodwatch@talmadge.org . Our SDPD Community Liason Officer (CLO) is Ofc Terry Hoskins. He works closely with Talmadge Patrol and Watch’s Block Captains to fight crime and urges all neighbors to follow-up with him on any crime information or concerns. Contact our CLO via email: thoskins@pd.sandiego.gov or cell# (760) 807-9957 when you have info helpful to him in protecting us. Click here for more information about how and when to call the police. Our Neighborhood Watch organizes National Night Out every year on the first Tuesday in August. Big thanks to all who made the 2016′s event the most well-attended NNO we’ve ever had! 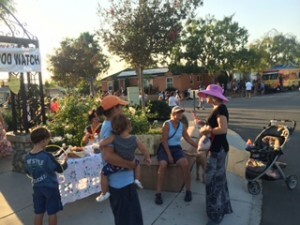 More than 200 residents enjoyed two food trucks, free sno-cones provided by Block Party Committee members Laura Pool and Kathy McClelland, Krispy Kreme donuts personally delivered by Talmadge Realtor Afton Miller, and glow sticks and cookies provided by Neighborhood Watch. We were joined by Chevelle Newall, representative from Assembly Speaker Toni Atkins’ office and Council Member Marti Emerald as well as the San Diego Police Captain Mike Hastings and Officer Romeo De Los Reyes. The timing of this year’s event occurred just five days after the senseless murder of 16 year SDPD veteran, John “JD” DeGuzman. We honored the memory of JD with words, tears and prayers for his family. We will remember his dedication, professionalism and heroism. The event concluded with our community walk. We were escorted by our very own Talmadge Watch and Patrol vehicle at dusk down 49th Street and up Winona Avenue. Once again, this annual event served to reinforce our partnership with SDPD and our commitment to crime prevention and safety for all of our residents. Below are some photos from National Night Out 2016.